Browse Behringer | Musical Instruments | GAK. BEHRINGER are a world-leading designer, manufacturer and distributor of professional audio equipment. Here at GAK, we are proud dealers of Behringer and their class-leading products, from PA Equipment, through to DJ Equipment, Mixers, Microphones, Guitar amps, bass amps, studio outboard equipment and more! Whether you are looking for a superb synth such as the Behringer Deepmind 6, or a mixing console such as the Behringer Eurodesk SX2442FX, GAK has a wide-range of Behringer products available to purchase. 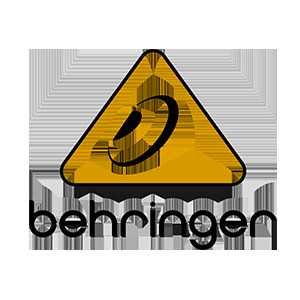 If you have any questions regarding Behringer and their line of products, feel free to contact our staff members who specialize in Behringer, call our shop on 01273 665 400. Super-compact 2-channel, 15-Watt bass amp designed to create classic tube-like sounds. Audiophile 2 In/2 Out 24-Bit/96 kHz FireWire Audio Interface. Ultimate 5-Channel Digital DJ Mixer with Sampler, 4 FX Sections, Dual BPM Counters and MIDI. Professional 3-Channel DJ Mixer with BPM Counter and VCA Control. 45-Watt 2-Channel Acoustic Instrument Amplifier with Dual FX and FBQ Feedback Detection. (B-Stock) Grade perfect box opened. Packaging worn. Bass Amp Modeler/Direct Recording Preamp/DI Box. Ultimate 7-Band Graphic Equalizer offering you a 15dB boost or cut of each band. The ultimate true analog, 6-voice polyphonic synthesizer, allowing you to conjure up any sound you can imagine. Professional-quality condenser microphones, designed to capture your sounds with incredible realism, sensitivity and accuracy. A condenser microphone designed to provide you with accurate audio recording. Gold-Sputtered Large-Diaphragm Studio Condenser Microphone. Dual-Diaphragm Studio Condenser Microphone, a home recording enthusiast’s dream come true. Gold-Sputtered Diaphragm Studio Condenser Microphone with 2 Interchangeable Capsules. Professional condenser microphones for studio recording and live applications. Premium 10-Input 2-Bus Mixer with XENYX Mic Preamps, British EQs and Multi-FX Processor. 12-Input, 2-Bus Mixer with Xenyx Mic Preamps, British EQs And 24-Bit Multi-FX Processor. A Premium 12-Input 2/2-Bus Mixer with XENYX Mic Preamps & Compressors, British EQs and a built in USB/Audio Interface. Premium 3-Input Mixer with XENYX Mic Preamp and USB/Audio Interface. High-Precision Stereo 2-Way/3-Way/Mono 4-Way Crossover with Limiters, Adjustable Time Delays and CD Horn Correction. Active 2-Way 12" PA Speaker System with MP3 Player, Wireless Option and Integrated Mixer. Active 2-Way 12" PA Speaker System with Bluetooth Wireless Technology, Wireless Microphone Option and Integrated Mixer. This bundle comes complete with two EuroLive B112W speakers, two XLR cables and a pair of speaker stands. Active 2-Way 15" PA Speaker System with MP3 Player, Wireless Option and Integrated Mixer. 500-Watt active subwoofer providing the ultimate in low-frequency reproduction. Professional 1,200-Watt 15" PA Loudspeaker System. 1,800-Watt power handling capacity subwoofer with a 18" Low-Frequency (LF) driver in a tuned enclosure. Active 150-Watt 6.5" PA/Monitor Speaker System with MP3 Player. High-performance 2,200W PA loudspeaker system with dual 15" woofers. 40-Watt Handheld PA System with Microphone and Rechargeable Battery. Professional 4,000-Watt Stereo Power Amplifier with ATR (Accelerated Transient Response) Technology. As the Shark is not a standard rack height, the rack kit takes approximately 1 1/2 units of rack space. High-Resolution, Active 2-Way Reference Studio Monitor with 5.25" Kevlar Woofer. High-Performance, Active 80-Watt Commercial Sound Speaker System. Active Studio monitor perfect for studio mixing, mastering and playback. Ultra-Compact, 100-Watt, 5“ Monitor Speakers. An Automatic Feedback Destroyer with Integrated Microphone Preamp, Delay Line, Noise Gate and Compressor. The fastest feedback suppressor on the market, with a response time of less than 0.2 seconds. High-Definition 15-Band Stereo Graphic Equalizer with FBQ Feedback Detection System. High-Definition 31-Band Stereo Graphic Equalizer with FBQ Feedback Detection System. Professional 4-Channel Active DI-Box in a single rack space. A professional mains/phantom powered 8-channel DI-box. High-Performance Passive DI-Box delivering impedance and signal matching. Automatic and Ultra-Fast Feedback Destroyer/Parametric EQ with 40 FBQ Filters and 96 kHz Audio Performance. Ultra-High Precision 24-Bit/96 kHz Equalizer, Analyzer, Feedback Destroyer and Mastering Processor.